"Trying is lying," a wise man once told me. You either are doing or not doing. There's no "trying" to do something. Unless you're learning something new and are literally trying over & over to get it right, "trying" is usually an excuse. I am so guilty of this. I say I'm trying to make jewelry. Well, then, I say back to myself, "Shut up & make it." And that's where I stand at the moment. Wanting not to try. Wanting to do. It sounds so simple. I wonder why it isn't. At some pep talk-y work seminar a few years back, the moderator asked a group of about 50 of us, "How many of you can draw?" Hardly anyone raised a hand. Then she said, "If I'd asked that question to a group of 5-year-olds, every single hand would have shot up. But you all heard my question as 'Can you draw as good as a professional artist?' That self-limiting critic in us shuts down creativity." So Sally, give yourself permission to make jewelry, just for the fun of it. Even if it's painting macaroni noodles and stringing them on yarn. telling yourself to shut up is cruel, in my (humble) opinion. so there's a problem here between wanting to so something and actually doing it - this is a real problem that everyone in the world works with on many levels, many subjects. it's part of the human condition. the problem is rich and deep and apparently necessary: how else does one learn anything but by wrestling with it - wrestling is really physical, you get to know the thing intimately right down to its smells. It's all a play on words in my opinion. We all are trying to do one thing or another it is all a learning process. The day you stop learning and trying is the day you are no longer breathing. But Sally you DO make jewelry!!!!! It's beautiful! I don't thinking trying is lying, I believe it's all part of the creative process. Trying, failing, succeeding, dreaming, trying again. My folks always said, "If at first you don't succeed, try, try again!" It's a far more positive approach for just about everything in life. Your comments are so great! All of them. I should clarify for Donna. 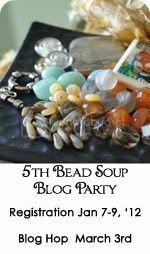 By trying in this case, I meant me saying "I'm trying to make jewelry" when, in fact, I'm reading blogs about jewelry making, visiting online bead shops, ordering beads, talking w/ other bead people. That's not trying to make jewelry and I'm lying! When I sit down in and actually do it, then I'm being more honest about the whole thing! I like the idea of giving myself permission to fail which Amy at Copper Diem suggested (in a comment blogger wouldn't let her leave). I want to be awesome from the start. HAHA. I so appreciate your comments and feedback. SO helpful! Thanks. Lori's Having a Book Giveaway!